In our first post-launch episode, we are all excited about having our souls reaped. After much celebration and frivolity we get down to business by discussing what we’ve been up to in-game: Lanntonio is holy hammering all the things, Jen is shooting all the things, Nevik is freezing and zapping all the things, and Breja is … well … Breja is puking on all the things. * We read, and respond to, a pair of emails we received from our wonderful listeners. This batch came to us from Rilandune and Frying Tuck. Thank you for the emails and voice mail! Keep them coming, really! * We received another mountain of tweets from @Foqbupog, @scanline75, @Torrack1714, @grindexp, @JCMonkeyD3, @sadromeo, @Manlow, @FreeFallWoW, @GrandNagus1, @C4ntbestoped, @Rob_pawlak, @shawno, @Kherova, @Cybrwolf0, @KaltonEly, @JustinKHixson, @Hawgeye_CTR, @apsana, @xSyneKx, @HomeTownHero008, @BrewmasterWansu, @Medros, @RoberBobroff, @sastewart111, @Kagerai_Leblue, and @GENERAAL00. Thank you for your tweets. Don’t forget that you, too, can send in your thoughts via social media outlets such as Facebook, Google+, and Twitter. * We posed the question on Twitter asking if your post-RoS gaming had deviated from your pre-launch plans. We got quite a few responses. Be sure to follow our show account, @ShatteredStone, on Twitter for future Questions of the Show. * We announced the winners for our 100 Word Story Contest this episode! Our grand-prize winner was @CkRtech for his amazing story; so much said with so little! Runner-ups for our contest included @Rilandune and @JCMonkeyD3 who will both be receiving a copy of Nate Kenyon’s Storm of Light. We decided to put the t-shirt winner in the hands of the community, so be on the look-out for a collection of all of the entries in the very near future! * With Reaper of Souls officially being in everyone’s hands we discussed our own experiences with the expansion including the number of hotfixes that have come down the pipeline since launch. If you were not already aware our editor, Shawn, is in-between jobs and could really use some help. If you can spare anything there is a Crowdtilt fund to help make ends meet. We are massively grateful for any help you can send his way. Thank you! * Friend of the show, Dredscythe from GrindEXP.com sat down with Sibcoe from Red Team Gaming prior to the launch of Reaper of Souls to discuss where the game has been and their impressions on where it is going in the future. * Reaper of Souls added a lot of new legendary crafting materials scattered all over the game for crafting a bunch of new legendary items. If you’re wondering if someone has compiled a list of all the materials and where to find them, the answer is yes! Check out DiabloFans Legendary Crafting Guide so that you don’t hunt aimlessly. * Archon the Wizard and Neinball from BlizzPro kicked off a new Diablo III: Reaper of Souls pod/vidcast titled Westmarch Workshop. The pair aim to highlight varying builds for everyone to potentially try out on a weekly basis. They are looking for feedback on their inaugural episode, so let them know what you think! You can catch Westmarch Workshop Wednesday nights at 6pm PDT over on Archon’s Twitch channel. * If you love running bounties in Adventure Mode and did not realize it, there are specific legendary items that you can only get from the Horadric Caches after completing all of an act’s bounties. Here’s a handy link to DiabloHub that lists all of the cache-specific legendary items you can hope to find. 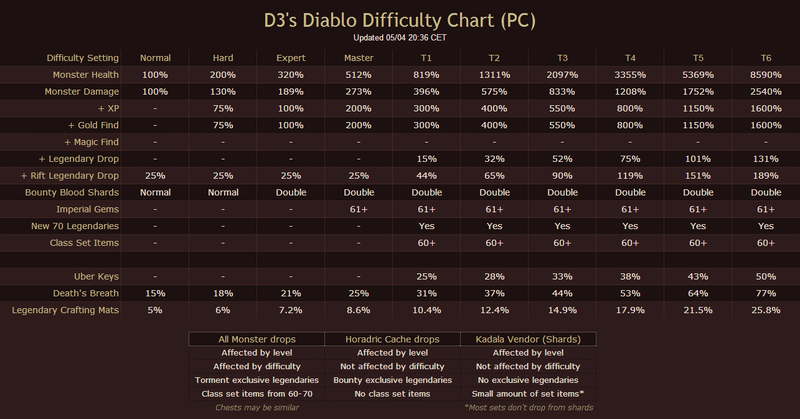 * Reddit user D3agl3uk put together and posted a chart on the /r/Diablo sub-reddit detailing the nuances of each of the new difficulty settings added in the 2.0 patch. * Blizzard traditionally puts together some pretty amusing April Fool’s Day jokes and this year kept that tradition alive. Be sure to check out Blizzard’s Happy Reaper, a Diablo-themed homage to Flappy Bird. Nevik managed to get a high score of TWO … BEAT THAT … if you dare. Melkor is back at it with another Diablo/Wizard themed rap/love-story. Forum Warriors pays tribute to many of the amazing folks contributing in the official Diablo III Wizard forums. Check out more from Melkor over on his YouTube channel. In this episode, we are still not at full strength as our 4th Musketeer could not be in attendance on account of work. Nevertheless we press on and get down to business by discussing what we’ve been up to in-game: Jen raining down vengeance on all the demons, Nevik is spinning to win, and Breja had a close encounter of the Nate Kenyon-kind. * We read, and respond to, a mountain of emails we received from our wonderful listeners. This batch came to us from Commander Bird, Foqbupog, and Torrack. Thank you for the emails and voice mail! Keep them coming, really! * We received a mountain of tweets from @pergosmaster, @scanline75, @grindexp, @Torrack1714, @HomeTownHero008, @Iruga, @JCMonkeyD3, @Rilandune, @Medros, @wombat1974, @obelu5, @Jaetch, @CkRtech, @Cybrwolf0, @shawno, @Foqbupog, and our very own @nevikjames and @The_Breja. Thank you for your tweets. Don’t forget that you, too, can send in your thoughts via social media outlets such as Facebook, Google+, and Twitter. * We posed the question on Twitter asking what your favorite part of Patch 2.0.1 has been so far. We got quite a few responses and at least one laundry list (reading comprehension FTW!). Be sure to follow our show account, @ShatteredStone, on Twitter for future Questions of the Show. * Have you submitted your story for our 100 Word Story Contest yet? Time is running out! Submit your Diablo-themed 100 word stories for a chance to win prizes including Nate Kenyon’s book, Diablo III: Storm of Light, a Shattered Soulstone t-shirt, and a Cute But Deadly figure set autographed by all four hosts of the show! Send your 100 word story to Show@ShatteredSoulstone.com with “100 Word Story Contest” in the subject line by 11:59pm PST on March 21st to be considered for the 100 Word Story Contest. How many more times can we fit “100 Word Story” in to this paragraph? * In case you’ve been living under a rock Patch 2.0.1 was dropped into our laps a month ahead of the expansion. We even held a round table to find out how some folks from the community are enjoying the patch one week in. Now that we’ve had two weeks with the patch, listen to see how the hosts are getting on with it. * Nate Kenyon recently paid a visit to Breja’s son’s school to talk about being an author and possibly inspire/conscript the next generation of Diablo novelists. As if that wasn’t enough Breja had a chance to sit down privately and chat with him about all sorts of things and even provided us with some signed copies of Diablo III: Storm of Light. Stay tuned to for details on how to obtain one! * You may have noticed that last episode we did not have an Official Forum Thread Masterpiece Theater for you. While we can’t always promise that this segment will always make an appearance, we do love a good OFTMPT. As always we are looking for your participation with this fun segment, send your Official Forum Thread Masterpiece Theater audio segments (or humorous forum threads) to Show@ShatteredSoulstone.com. This episode’s Official Forum Thread Masterpiece Theater segment bed music included Rondeau from Sinfonie de Fanfares by Jean-Joseph Mouret and Pannonia Boundless by Alexandra Vrebalov. * March 25th is rapidly approaching and the reaping is almost here. Best to be ready by equipping yourself with some amazing IRL Diablo gear. * Friend of the show and wizard extraordinaire Jaetch put together a video showcasing the amulet Halycon’s Ascent (tribute item to Deadmau5) in the final moments of the RoS closed beta. * Talented comic artist and podcaster Scott Johnson was inspired to pen a comic in tribute to the vitriolic community comments surrounding Diablo III and patch 2.0.1. You can’t just please everyone eh? * If you love games and food, then you’ll love Kierpanda’s Eat. Game. Live. blog where she puts together game-inspired culinary masterpieces. Be sure to check out her Reaper of Soles (recently featured as an Artisan Showcase on the official Diablo III site) and Parsnips of Reflection dishes! * We are over a month late in sharing Part 6 of Design a Legendary but better late than never right? This final piece of the Design a Legendary series ties everything up and focuses on the creation of the Shard of Hate and features a Q&A with Aaron Gaines, the artist responsible for the visual creation and representation of the item in-game. * Who doesn’t love a catchy tune? How about some hip-swaying action? Jaetch decided to lighten the mood with this little Diablo-themed music video. Those hips just don’t lie folks. * Patch 2.0.1 has also inspired comic artist Josue Pereira of NerfNow! to put together two Diablo-related strips. Be sure to check out his strips Old Flame and Loot Themed Amusement Park! * Tatasinke is back with another edition of his Paper.li newspaper, the New Tristram News. Check it out and subscribe! The Barsternian by Irish geek-metal band Mölten Cöre is a love song to the barbarian. And let’s face it, the barbarian is amazing, really. NO, REALLY. While I haven’t found too much more by this group you can check out their YouTube channel and band member Slainester’s Soundcloud page. Patch 2.0.1 dropped sooner than many of us expected and with it came a lot of changes to the game. Has it changed the game for the better? And how does it feel without the final pieces of the puzzle coming in Reaper of Souls? We gathered a group of voices from the Shattered Soulstone community to find out their impressions of the patch so far. Joining us for this round table was 9pad (@9PadGaming), Cyberwolf (@Cybrwolf0), Dr. J Dredscythe (@grindexp), Jaime (@JCMonkeyD3), Jesse (@HomeTownHero008), Scanline (@scanline75), and our very own Breja (@The_Breja). If you couldn’t make it to our Patch 2.0.1 community round table fret not, there will be more round tables in the future. You can count on another round table happening shortly after Reaper of Soul launches. So go download Mumble to join in on the fun with us.